This is the home of Misha: A bellydance performer, instructor, and choreographer in Sarasota, Florida. 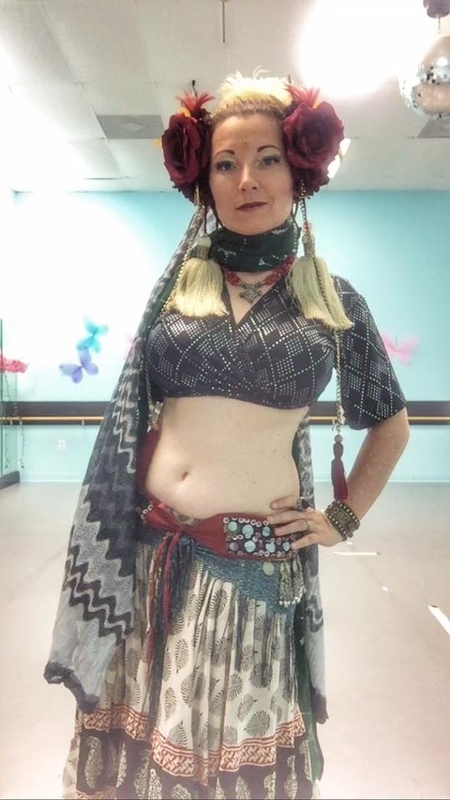 One of my great passions in bellydance is costuming. Creating new looks, designing and sewing beautiful pieces, hunting out unique jewelry and elements to add to a costume is something I find extremely fun and exciting. I’m always on the look out for bits and baubles to transform into something new and gorgeous; it’s one of my favorite parts of the dance! So once you have this stunning wearable art it’s time to head off to class, right? Well, maybe not always. Bellydance classes of any type are a wonderful opportunity to dress up and feel feminine and lovely. I often have students who take this time to feel beautiful in their bodies by wearing special makeup, hair ornaments, and even clothing. But it’s important to know what’s appropriate for class, and what is better left on stage. Part of the reason for the differentiation is functionality. I love wearing comfy class clothing like capri pants and babydoll t-shirts for dance as they allow me to move and easily see my movements when I drill. As an instructor, I also like to keep my feet and legs visible to help students see what drives each movement. If you’re a student, wearing long flowy skirts can be fun but might make it a bit tough for your teacher to see your movements to guide you. Plus, many of our costumes are great to wear on stage, but not necessarily comfortable to wear for extended periods of time. Costume pieces like heavy coin bras and tassel belts might not be advisable if you want to stay comfortable while learning. Another consideration is the level of wear and tear that regular use may put upon an item. Certain fabrics, like delicate Egyptian assuit and thin Indian lurex, are gorgeous to wear. But they often won’t hold up if they are worn regularly in class. The fabric may tear or rip, and is often not easy to repair. Other costume pieces may have elaborate accessories and decorations such as heavy pendants, stones, and coins. Regular use of these items can result in bits falling off, or damage to the pieces. Expensive pieces of jewelry, such as silver and stone, that are one-of-a-kind are also often best left in the safety of home. All of these are great examples of items that are better shown on stage than regularly in class. They can be great to enjoy on a special day, but are often best left to be showcased during performances. I love dressing up for class, and I encourage my students to do so too. The key is finding the happy medium between comfort and beautiful adornment. I’ve found having several pieces of dedicated class clothing, including affordable jewelry and simple scarves I’ve picked up along the way, is a great substitution to using my fancier stage items. This way I’m able to dress up and sate my bellydancer’s desire to be ornamented while still protecting my one of a kind costume pieces. ← What makes GREAT Tribal music?